Rat Register Number: 826 (attaining the office of Prince Rat). Brentford born John was a prolific actor who became a very familiar face on British television. 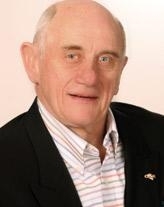 Best known for playing Jim Branning in the BBC's EASTENDERS for 13 years, John Bardon also appeared prominently in many other shows including 'Only Fools and Horses', 'Dad's Army', 'Rumpole of the Bailey' and 'The Sweeney'. Film roles included 'Clockwise', 'Fierce Creatures' and 'East is East'. In 1982, he proved further versatility by portraying the comedian Max Miller in Channel 4's 'Here's A Funny Thing' and, for his work in the show 'Kiss Me Kate', he won the Laurence Olivier Award as Best Actor in a Musical. He married Enda in 2002.